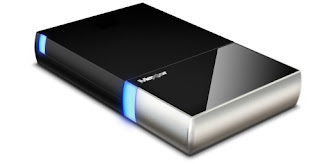 Maxtor has developed a backup drive that ensures HIPPA security and any other security too, as a matter of fact. The BlackArmor drive is a portable USB hard drive that ensures data encryption on a hardware based level. What does this mean? Basically it means that the security is stored on the hardware and not on the drive. If the drive is removed from the enclosure it's completely unreadable and in the enclosure its secured using government grade AES encryption at the hardware level. It's available in 160GB and 320GB drive capacities, but only runs on the Windows platform. This is because an unlocking utility is required. I'd think it would run OK with Parallels on a Mac, but I'm not sure. If you're looking for the utmost in security for you data, look no more. I am a dentist practicing in Arvada, CO and I just found your blog. Great Site! We just went to digital x-rays and this is something we could use. Thanks and welcome! If there is anything you'd like to see covered, please let me know.